Sierra Shepard is a seventh grade honor student who faces expulsion in Longwood Middle School for an innocent mistake. It was lunchtime when Sierra realizes that she took her mother’s lunch, and she finds a paring knife. Sierra thinks the right thing to do is to turn the knife into the lunch lady Sandy because weapons in school are prohibited. Sierra gives the knife to Sandy, but Sandy thinks she brought that knife to school for criminal action, so she sends Sierra to the office. The school principal, Mr. Besser, is in shock, when Sierra, an honor and leadership student, brings in a weapon to school. Mr. Besser realizes that he has to expel her, because she infringes the zero-tolerance policy for weapons. Sierra’s parents are mad for a principal to expel a student for an innocent mistake, so Sierra’s dad, an attorney lawyer, tries to resolve the problem by arranging news trucks and news reporters to intimidate the principal. Sierra goes to school, but not to her classes. Instead, she goes to the suspension room all day. In the room, she meets a new friend named Luke who later became her closest friend. During Sierra’s suspension time, her friend Colin starts a protest about expelling Sierra for a tiny mistake. Sierra’s parent arranges a meeting with the principal and the superintendent to see if the final decision will be that Sierra is expelled or not expelled. 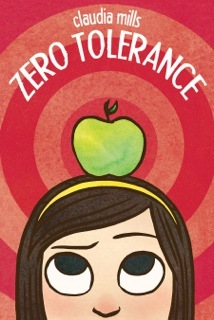 The book Zero Tolerance was book that I was not going to read. because I thought it would be a children’s book.I was also curious if Sierra was going to be expelled or not. I thought the author’s writing style was good because it was easier for me to read and to know what was going in the book for me to imagine it in my head. The weakness was that the book seemed slow paced for me when I was reading it. I would also recommend this book to sixth graders and seventh graders. If I could go back in time, I would definitely choose this book again. If I had to give a rating for this book out a ten, I would give it an eight. 1. What job does Sierra’s dad have? 2. Why was Sierra suspended from school? 3. Why was there media attention after school? 4. How come everyone was surprised when Sierra got into trouble? 5. Why did Sierra turn in the knife? 1. What was the other school, that Sierra’s mom was suggesting? 2. How did Sierra frame Ms. Lin for writing the article in the newspaper? 3. Why was the choir trip so important to Celeste? 4. How many people signed for the petition about expelling a student for an innocent mistake? 5. What is the name of the boy that Sierra talks to in the suspension room? 1. Who did Sierra saw with Colin in school? 2. What was on Mr. Thomas Alford Besser criminal record. 3. Why did Sierra go to the last rehearsal for choir for the upcoming trip. 4. How did Mr. Besser find out that Sierra wrote that letter to the Denver Post? 5. Did the school expel Sierra?